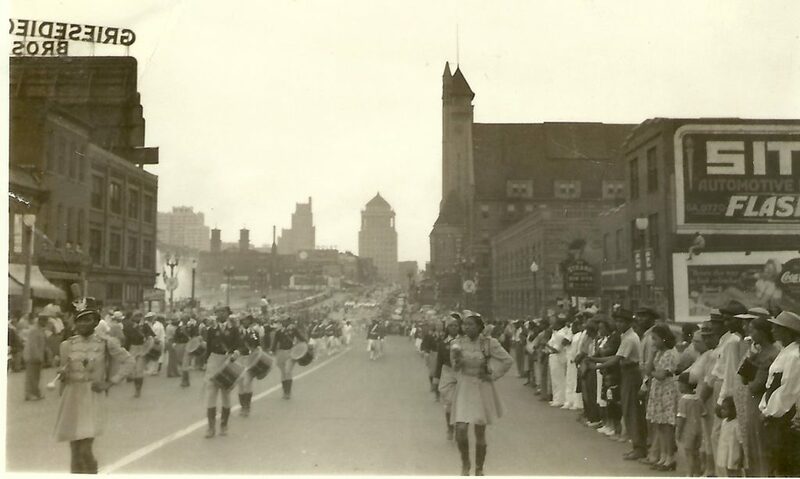 Undated parade scene, Market Street looking east. This view shows Mill Creek Valley’s business district. Decoding the City documents the many lives of the Mill Creek Valley area of St. Louis. Urbanized in the 19th century, the area became the city’s center of black culture before being completely cleared by the city in the late 1950s. The remixed Mill Creek Valley bears spatial stories related to its heyday, as well as later moments both banal and triumphant. Starting with an American Culture Studies course offered in spring 2017 at Washington University in St. Louis, Decoding the City attempts to present the vibrant place memory of Mill Creek Valley amid the larger landscape of the city.